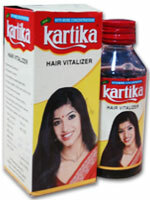 Buy Kartika Hair Vitalizer. Dandruff, Hairfall, Weak Hair roots, healthy hair, shiny hair, cools head and eyes. Prevents Hairfall, Strengthens Weak Hair, Removes Dandruff. Karthika Hair Vitalizer Prevents Hairfall, Strengthens Weak Hair, Removes Dandruff. Kartika Hair Vitalizer - Careless makes you Hairless! Kartika hair vitalizer is being prepared with eleven rare herbs using modern technology. It gives good hair growth and natural strengthening to weak hair roots. The one and only relief to problems regarding hair fall, dandruff, and gray hair is Karthika Hair Vitalizer. For the past 190 years Karthika has been manufacturerd by good and genuine siddha methods. You will come to know the efficacy of its usage in 2-3 hours after using it. *Grows healthy, thick and shiny hair. *Concentrated and filtered seven times with coconut oil. *Penetrates deeply into hair roots. It secures hair from shedding down avoiding heat generated in head. Those who have severe dandruff disturbances must apply one full lemon juice for 15 minutes on head. After that take bath with shampoo or sigaikai. After hair wash apply 5-10 ml Karthika hair Vitalizer to the same wet head and take bath by not applying either shampoo or sigaikai. Continue this process for 15 days for relief from dandruff disturbances. After that stop using lemon amd continue only with Kartika Hair Vitaliser. First shake the bottle well, then massage gently with finger, under the hair by taking 5-10ml. As there is a chance to freeze store Karthika in warm and dry places.